--- The body of Tyrone Power will be interred near the crypt of Rudolph Valentino, but Power's mother, 70 and ill, won't be told of her son's death. "The news would kill her," a maid said Tuesday. The disclosure recalls the benevolent family conspiracy that kept the mother of crooner Russ Colombo ignorant of her son's death. She died in 1944 unaware that the crooner accidentally had shot himself 10 years before while examining an old Civil War pistol. Power's mother, who lives quietly in a Hollywood home with a nurse and a maid, suffered a stroke several years ago. "We don't have a radio in the house, and we only let her watch certain programs on television," the maid said. Power, who died Saturday of a heart attack on a movie location in Spain, was a devoted son. He visited his mother frequently while in Hollywood and sent her a constant flow of cards when away. The body of the 44-year-old actor was scheduled to arrive by plane tonight accompanied by his widow, the former Debbie Ann Minardos. She expects a baby in February. Funeral services were tentatively scheduled for Thursday noon. However, a Catholic source here said that it is doubtful Power can be buried in the Catholic faith. Although born and baptized a Catholic, a source said, "Power automatically excommunicated himself when he married the former Mrs. Minardos, a divorcee and the actor's third wife. The church considers Power's marriage to his second wife, actress Linda Christian, still a valid marriage. His first marriage to actress Annabella was not valid in the eyes of the church. Miss Christian arrived Tuesday night from Paris and New York. 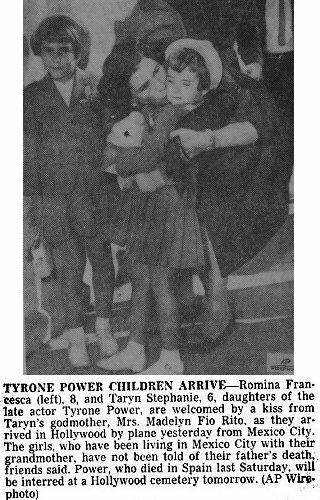 Miss Christian's and Power's two daughters, Romina Francesca, 8, and Taryn Stephanie, 6, arrived from Mexico City where they had been living with their grandmother. The children have not been told of their father's death.